I didn’t see anything particularly meaningful at first. Pairs of people – man and woman, old and young, adult and child – grabbed meagre shelter from the sun under straw mats on poles. They had set their nets the night before, hauling them in at first morning light. Each pair was making its way carefully through a mound of gillnet, the classic net that sits in the water like a fence and waits for animals to entangle themselves. Their target was crabs, three species that mostly go for export. The shells and sea stars were discarded, having no local market, and the seagrasses and seaweeds were shaken free as the nets were restacked for the next day’s fishing. Overall, though, the unintended catch was blessedly limited, especially compared with the excesses of trawling. Crab gillnet fishers extract the catch at Vellapatti (Tuticorin area), India. Photo by Amanda Vincent/Project Seahorse. Crab gillnet fishery shore worker at Vellapatti (Tuticorin area), India. Photo by Amanda Vincent/Project Seahorse. Crab gillnet fishers at Vellapatti (Tuticorin area), India. Photo by Amanda Vincent/Project Seahorse. I did my fisheries thing, happy to be among ocean people. I tried to discern landings and revenues and costs and challenges. I photographed wonderful weather-beaten faces crinkling in smiles as they tried to figure out my role there while sorting nets. I chatted with fishers in a broken English/sign language mix, pointing to my kids fossicking on the beach as I asked about theirs. And I got my thumb slashed by a crab with exceptionally long and agile claws that somehow reached back to assail me, much to the amusement of the fisher who handed it to me. Saveri Anandam, conservation leader, at Vellapatti, Tuticorin area. Photo by Amanda Vincent/Project Seahorse. And then I met Saveri Anandam. 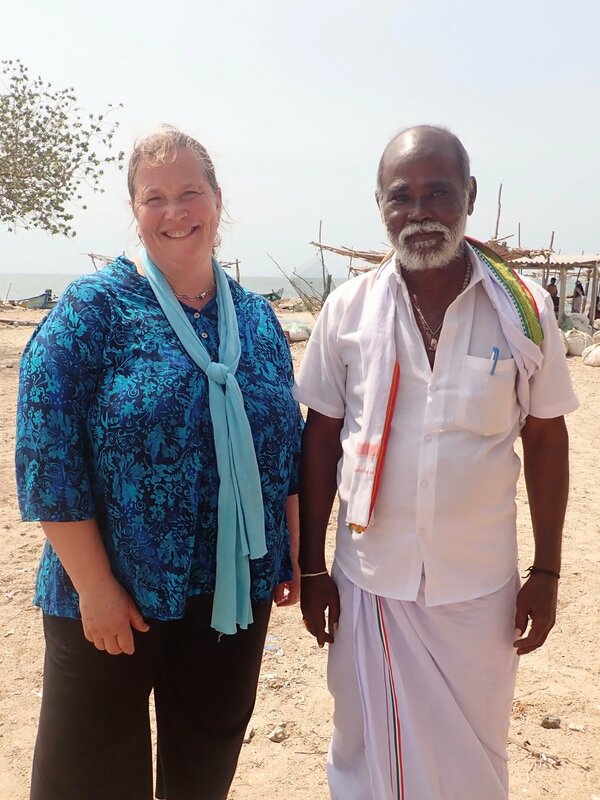 Our friend and colleague, Dr. A. Murugan, is a wizard about the biology and conservation of this region. He introduced me to a distinguished bearded man in white shirt and lungi (men’s sarong) who had been head of the village for 18 years and remained head of the marine conservation committee. As our chat soon revealed, and as Murugan confirmed, this man had made decisions of considerable consequence to the ocean. Mr. Anandam had been the captain of a trawl boat when he became appalled by the bycatch and waste in his gear. That, plus the frequent conflict between trawl and traditional gear – conflict that often penalised the poorest fishers – led him to abandon trawling as his own occupation. He also became concerned that many people from his home village were mining coral for their livelihoods, and threw his weight behind government efforts to end the destructive practice. During this time, he happened to bring a statue of the Blessed Virgin Mary from a ruined island shrine to a chapel on the mainland. One night, the icon spoke to him and suggested his village transition to using gillnets to target crabs. He conveyed this vision to his neighbours, prompting them to embrace the idea. They have now been landing crabs in this spot for 24 years, with considerable market success. This transition from mining coral to passively trapping crabs (mostly at least) is huge in conservation terms. Showing yet more conservation leadership, Mr. Anandam also convinced villagers to throw back any seahorses and sea cucumbers that came aboard their small boats as they hauled in their nets, in all probability to live another day. Given the huge pressure on the ocean in India, I’m cheered to find such seeds of progress. We find hope where we can.